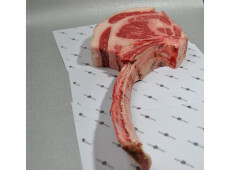 A Tomahawk steak is a striking piece of meat. You could say it's a real mensteak. With his long bone, it catches the eye immediately. 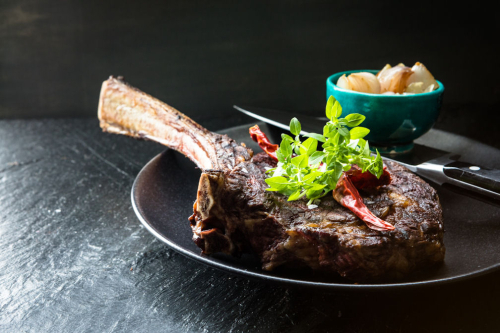 You could consider the Tomahawk steak as a roast. 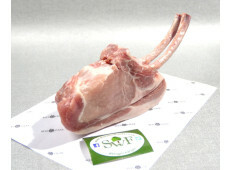 A big piece of rib eye with a long bone, that can be roasted easily on the barbecue. This takes about 1-1,5 hour, depending on the weight and it is delicious with a nice chimmichurri sauce. If you want to know more about all kinds of different meat at Beef&Steak, we would love to inform you. For more information you could call our helpdesk at phone number 0172-577 147. You could also send an e-mail to the adress info@beefensteak.nl. You could also ask your question with the chat function.